As if the tantalizing greasy smell wafting out of Burger King wasn’t enough to convince you to go inside, free fries might do the trick. 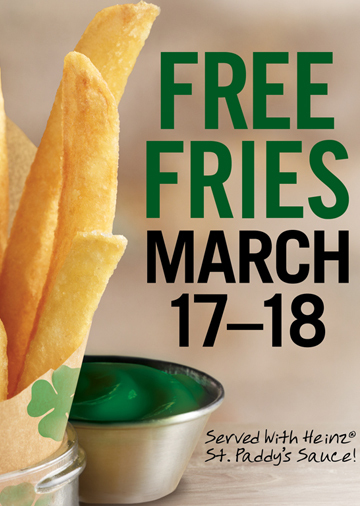 This March 17th and 18th, Burger King will be serving up free fries and as an added festive bonus, they’ll have green ketchup. In an effort to spread a little luck, Burger King is offering free value-sized fries. Earlier this year, they released a new version of their french fries. If you haven’t tried them, this may be a great opportunity to see what you think. Regardless of how they taste, the green ketchup will likely distract from the fries all together. Heinz created a line of colorful ketchups back in 2000 which were met with little excitement. As much as we love our chemically dyed products, green ketchup may just be taking it one step too far. But hey, it’s free and it is St. Patrick’s Day after all. If we could just get Burger King to give away free green beer we may be able to get on board. No coupon is necessary and you don’t have to make a purchase to score your free fries. They are limited to one per customer. Head over for your own pot of golden fries this weekend.